Metallurgical coal, also known as coking coal, is used to produce coke, the primary source of carbon used in steelmaking. Coal is a naturally occurring sedimentary rock formed over millions of years as plants and other organic materials are buried and subjected to geological forces. 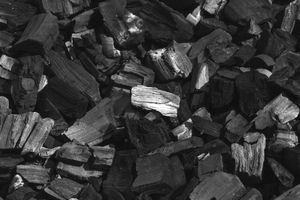 Heat and pressure cause physical and chemical changes that result in carbon-rich coal. Metallurgical coal differs from thermal coal, which is used for energy and heating, by its carbon content and its caking ability. Caking refers to the coal's ability to be converted into coke, a pure form of carbon that can be used in basic oxygen furnaces. Bituminous coal—generally classified as metallurgical grade—is harder and blacker and contains more carbon and less moisture and ash than low-rank coals. Hard coking coals like anthracite have better coking properties than semi-soft coking coals, allowing them to garner a higher price. Australian HCC is regarded as the industry benchmark. While PCI coal is not often classified as coking coal, it still is used as a source of energy in the steelmaking process and can partially replace coke in some blast furnaces. Coke making is effectively the carbonization of coal at high temperatures. Production normally takes place in a coke battery located near an integrated steel mill. In the battery, coke ovens are stacked in rows. Coal is loaded into the ovens and then heated in the absence of oxygen up to temperatures around 1,100 degrees Celsius (2,000 degrees Fahrenheit). Without oxygen, the coal does not burn; it begins to melt. The high temperatures volatize unwanted impurities, such as hydrogen, oxygen, nitrogen, and sulfur. These off gasses can either be collected and recovered as by-products or burned off as a source of heat. After cooling, the coke solidifies as lumps of porous, crystalline carbon large enough to be used by blast furnaces. The entire process can take between 12 and 36 hours. Properties inherent in the initial input coal heavily influence the ultimate quality of the coke produced. A lack of a reliable supply of individual coal grades means that coke-makers today often use blends of up to 20 different coals in order to offer steelmakers a consistent product. Approximately 1.5 metric tons of metallurgical coal are required to produce 1 metric ton (1,000 kilograms) of coke. Basic oxygen furnaces (BOF), which account for 70 percent of steel production worldwide, require iron ore, coke, and fluxes as feed material in the production of steel. After the blast furnace is fed with these materials, hot air is blown into the mixture. Air causes the coke to burn, raising temperatures to 1,700 degrees Celsius, which oxidizes impurities. The process reduces the carbon content by 90 percent and results in a molten iron known as hot metal. The hot metal is then drained from the blast furnace and sent to the BOF where scrap steel and limestone are added to make new steel. Other elements, such as molybdenum, chromium, or vanadium can be added to produce different grades of steel. On average, about 630 kilograms of coke are required to produce 1 metric ton of steel. Production efficiency in the blast furnace process is highly dependent upon the quality of raw materials used. A blast furnace fed with high-quality coke will require less coke and flux, lowering production costs and resulting in a better hot metal. In 2013, an estimated 1.2 billion metric tons of coal was used by the steel industry. China is the world's largest producer and consumer of coking coal, accounting for about 527 million metric tons in 2013. Australia and the United States follow, producing 158 million and 78 million metric tons, respectively. The international market for coking coal, not surprisingly, is highly dependent on the steel industry. Major producers include BHP Billiton, Teck, Xstrata, Anglo American and Rio Tinto. More than 90 percent of the total seaborne trade of metallurgical coal is accounted for by shipments from Australia, Canada, and the U.S.
Valia, Hardarshan S. Coke Production for Blast Furnace Ironmaking. Steelworks. World Coal Institute. Coal & Steel (2007).